The talk of a Helloween reunion with singer Michael Kiske and guitarist Kai Hansen has been going on for many years now, but nothing has ever come out of it. But no matter how many times any of the parties has denied that it would ever happen, the talk has never silenced and it seems like the Helloween fans will never give up on it. When both Kiske and Hansen were touring with Avantasia a few years, the rumours came to life again. Especially since Michael Kiske has on several occasions spoke of his loathing for heavy metal and his solo releases has been pop and ballads and his recent project, the Frontiers Records driven Place Vendome, consisted of AOR and melodic rock. But with his involvement in Avantasia, Kiske was all of a sudden back on doing heavy metal and with Hansen’s involvement, well, lesser things has started rumours before. 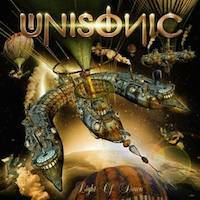 When Unisonic first saw the light of day in 2009, it was Kiske that teamed up with Pink Cream ’69 members Dennis Ward (bass) and Kosta Zafiriou (drums) and guitar player Mandy Meyer (Krokus, Asia, Gotthard) that were the core of the band, of course Ward was heavily involved with Place Vendome and he snatched Kiske from there. But it was when Kai Hansen joined the group in 2011 when all hell broke loose. Now, Hansen had been trying to recruit Kiske as the lead singer for his own band Gamma Ray for ages with Kiske declining every time, so when Hansen took the opportunity to work with Kiske in Unisonic instead, it was the closest to a Helloween reunion ever and of course the fans picked up on that. The fact that to many, Hansen and Kiske were Helloween’s top song writers back in the day so of course expectations on the debut, self titled 2011 Unisonic album were astronomical, to put things mildly. Because people was expecting a new Keeper Of The Seven Keys kind of album and I guess the only ones who weren’t disappointed by their first effort were the one’s who didn’t expect that. The song writing credits shows that the album’s song writing was split between Ward and Hansen with Kiske only co-writing two of the tracks. Of course, this didn’t sound like Helloween, this wasn’t Helloween, this was Unisonic – a new band. For me, that album left a lot to desire song wise. To me that album was a decent hard rock outing, but had too many fillers for comfort. It showed that there was something to build on for the future, but it never grew on me and it really left me underwhelmed. But the album was clearly popular enough to rationale a follow up, a follow that seems to be an even less Helloween-ish release with no Hansen writing credits at all and only three co-writes for Kiske. This is a Dennis Ward creation, no doubt as he stands as the producer as well. On the last album, he shared producer duties with Hansen. This must be a big set back for all the fans out there looking for a closer collaboration between Kiske and Hansen in search for the oh so wanted Helloween reunion. But again, this is not Helloween, this is Unisonic, a band that should be getting a fair chance standing on its own two feet, so let’s just forget the Helloween comparisons and take this album in without any preconceived or insular thoughts – if that’s possible. The album starts out with a big, bombastic intro called “Venite 2.0” that sounds like a soundtrack to some sci-fi movie. It sure builds up a vibe and it leads us into the real opening track, “Your Time Has Come”, a brilliant melodic metal tune, catchy as hell and one of the best songs Helloween never wrote. Sorry about the comparison just one song into the album, but it can’t be helped, that’s the way it sounds like. With “Exceptional”, the title really does justice to this awesome piece and a again Helloween shows up, this time sounding like a more “just rock” version of said band. When a song finally doesn’t have any Helloween in its sound, the lyrics does instead. “Not Gonna Take Anymore” is a really good, catchy and sing-along ish slow rocker that holds the lyric “the walls of Jericho came tumbling down…”. Hmmmm, guys, you really brought this one on yourselves. As the album goes by, the Helloween references becomes more and more erasure and gives Unisonic more of an identity. “Blood” is brilliant and heavy ballad and “When The Deed Is Done” sounds like a heavier version of Place Vendome – very, very good. The version of the album I got my hands on is the European version on which we get a European bonus track. In the days when even CDs are out of fashion, the whole idea with bonus tracks is totally redundant. The whole idea with bonus tracks was to convince people to buy the CD version instead of vinyl back in the day and later lure people to spend their well-earned money on a Japanese edition as well as the original because Japan always get the extra track. But today, bonus tracks has no place on a record what so ever. In this case, the bonus track becomes a throw away or a lost track because “Judgement Day” is an awesome song that should have had a place in the regular set list. On the Japanese version – which I haven’t heard – there’s a bonus track called “Dare”. I wonder how much of a throwaway that one is.